There comes a time when we have to decide which path to take. To act on a decision that is based on your values or conscience. Do you stand firm or step aside? An opportunity to make your stand known or to back off when the critical time comes. Whether in the workplace or in life, there will be times when we need to act not just with words but with deed. What is your stand? In the workplace, all companies would have rules, processes, compliance policies and so on. In practice, there are situations where decisions are not clear-cut or grey due to pressure to succeed or pressure to follow the decision of higher authority which might be bending or breaking the rules. What do you do? When you know that something is wrong, what is your response? Do you stand up against it? Do you ignore it? Do you compromise and accept that its part and parcel of corporate life? Just like anything in life, once we compromise or accept a situation, the line is drawn and the stand is known by others. When was the last time you stood up for what you believed in? Under what situation would you make your stand? The reason why most do not stand up for what they believe is due to fear. Fear of the repercussions. Have you considered the repercussions of not standing up to fear? What do you lose when you give in to fear? Do you gain anything by living on the parameters of fear? If we shift the thought process from fearing what we will lose to what we will gain from standing up for what you believe, what would that look like?. I have no doubt that if each of us submitted to every fear that we have, we would not have accomplished much. When we stand up to fear, we will find that it will strengthen our resolve, commitment and perseverance. All qualities that we will need to go through life. Living out your values and principles. It is easy to say that we value integrity, honesty etc. It is another to act it out. It takes the next level of courage to take action especially in the face of opposition. Values and actions are aligned. When our values and actions are aligned, we are balanced, clear on our identity and are respected by others. No one respects anyone whose words and actions are misaligned. Develop a principled centered character. The decisions and actions that you take are based on your guiding principles and beliefs. It will be consistent and predictable. There is no confusion on the reasons behind your decision and action. People around you will trust you based on your consistent decisions and actions. Courage in action. It takes courage to make a stand that might not be popular or goes against the majority. Taking your stand is for you. Compromise is for others. There are times when compromise is required but not when it affects your values or belief system. Confident and being comfortable in your own shoes. You know who you are and what your response is to tough situations. You will only know where you stand when you stand up for it. Every decision and action we take shows you the stand you are making. Not doing something is a stand just as much as doing something. Letting others fight your fight only works for so long. Make your stand, for your character depends on it. It might also inspire someone else. Each of us creates a ripple effect on those around us. Stand up and tall for what you believe. Annoying Person, Could it be you? Have you ever come across someone that just annoys you? That person who just seems to trigger a negative response in you. Just hearing them or seeing them makes you want to turn the other direction and walk away. What do you do when you can’t escape? You are in a meeting with them or have to work with them. What do you do? They think and act like they are better than you. Maybe they are fountain of knowledge. Give credit where credit is due. They believe that they are better than you. Maybe they are but does that really matter. They think that they know it all and therefore have to let everyone know that they know it all. They feel entitled. Entitled to receive all the credit, all the recognition and awards. They feel that the world revolves around them. They are annoying. Some people don’t realise that they are annoying. Of course some do know and enjoy it. They are not liked. They don’t know why people don’t like them or why no many people want to get to know them better. There might be something wrong about them. They might not be as good as they think they are. Why are you annoyed by these people? You see them for who you believe they are – not as good as they think. Misalign with your value system. Battle of egos – that’s right yours vs. theirs. You just don’t like their behaviour and attitude. Change your perception, maybe you can learn something from them especially around what NOT to do. Look at one positive quality. There must be at least one positive quality that they would have. No one is perfect. Be objective and professional. No drinks with them for sure. Are you that annoying person? 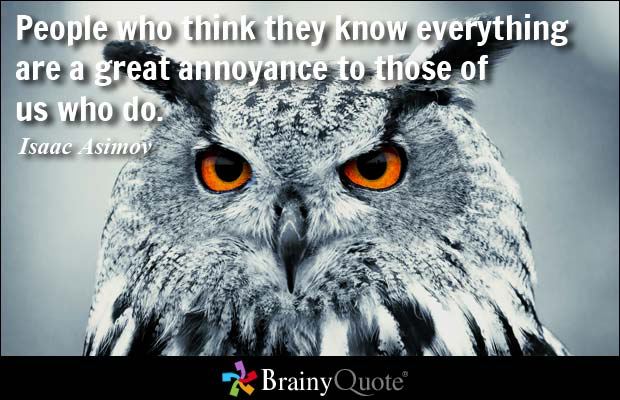 Think about one person who annoys you. What is it that annoys you? List them down. Now compare that list of annoying traits with your values or beliefs. Are there any similarities? What are the differences? What can you do to make your interactions more pleasant for you? What can you learn from them? What can you learn NOT to do? Now ask yourself again, are you that annoying person. Truth be told, we can’t avoid them and therefore might as well make the best of the interaction. There is always something to learn from one another and therefore, if you take that approach, you will surely learn something. Enjoy! Who likes a pat on the back? Crave to hear the words “Well done!”. Desires to garner more praises and accolades? Who does not?? We all do like that occasional praise. We also know that it is good to give credit where credit is warranted. There is a saying “it is better to give than to receive.” Do you agree? Ask yourself, do you give or receive more praises? Reflect back on the last week, how many times did you give praise or credit to someone. How many times did you receive a praise or credit from someone? If you did not give or receive any, how does it make you feel? Under what circumstances did you give them? Did you mean it? Did the person deserve it or were you just being nice and polite? Do you know what the praises were for specifically? Could you then improve upon that in the future? Was there anyone that maybe you could have given credit to? Most of us don’t work in vacuum hence there must be people around you that helped you that you could share credit with. No one deserves your praises cause your standards are just so high. Do you have difficulties giving others credit? Ask yourself, why is that? Do you give praises too liberally? Is there any depth or meaning to the praises that you give? What is the balance? Is there a balance? Should there be a balance? What is your balance? What is your approach? We all know that it is good to give credit where it is due. If you are having difficulties, then maybe it is a good day to start. Giving credit where credit is due is a very rewarding habit to form. Its rewards are inestimable. Conflicts are inevitable, how you handle it is up to you. Conflicts. I am not comfortable with it. If possible I would avoid it. That’s my personality. However, after years of working, I had developed another approach. At work, conflicts need to be dealt with quickly. This is to prevent, what could have been a minor issue from becoming a full-blown conflict where there are no winners, just losers. Conflicts can be toxic in any workplace environment. People will start to gossip, talk behind our backs, groups are formed, judgments are formed and verdicts decided upon. All this without actually knowing the truth. What should we do with conflicts? It is uncomfortable. Most of the time, we are ill-equipped to handle it. The most obvious answer is to deal with it and work it out. Solve the matter and move on. However, the question is how? “Whenever you’re in conflict with someone, there is one factor that can make the difference between damaging your relationship and deepening it. That factor is attitude.”– William James. What is the core issue? Focus on the issue to be solved. Am I holding on to my idea because I want it done it my way? Do I think of myself as the “loser” if I compromise? Is the fear of being “wrong” causing me to be fight? Find out the motive behind your attitude. There are always many approach to solving a problem, hence release the need to be right or the need to do it my way. What judgements or underlying beliefs am I holding onto that could be holding me back? We all have a set of underlying beliefs that will shape the way we think and how we perceive or interpret a situation. For example, if I have an underlying belief centered around hard work and therefore the need to work long hours. This will therefore cause me to perceive someone who works not as long as me, as someone who is lazy or not pulling his/her share of the weight. Let’s be open to the fact that different people work differently so long as the outcome is reached, not the way that it is achieved. Releasing the underlying beliefs can sometimes help you view situations in a different light. Am I open to different options and approaches? Be honest. If you are not, then it is safe to say that there is no point in wanting to solve a conflict. Conflicts cannot be resolved if people involved are not open to varying solutions. If you have answered those questions and now know the issues, the underlying beliefs that you hold and am open to options, then we can proceed to the action steps. Set up a discussion. Discuss in an open and objective manner with regards to the issue, where the challenges are and willingness to move forward. Summarise and repeat what you hear. Listen to the issues, options, concerns and solutions and summarise or repeat what was said. This will help you do 2 things (1) help you to truly listen (2) demonstrate that you have listened and heard what was said. It will also provide clarity and opportunity to clarify if there were any misunderstanding or assumptions made. Agree on what you agree on and agree to disagree on those you don’t. Moving forward does not require perfect agreement. We don’t have to agree on everything. We just need to know what the disagreements are and know how to move forward. Agree on what is required to move the task or action ahead. In most cases, the disagreement comes from method of execution vs. the goal or desired outcome. Remember, there are more than one way to get to the destination. Commit to the course of action. Agree and be committed with it. Sometimes we just agree just to get out of a meeting but we know that this approach is not going to work as there is no agreement or commitment. There must be not just agreement but commitment to the course of action. Accountability. Ensure that there are accountabilities in place for all involved. A structure or process in place to track and keep everyone on track. “The harder the conflict, the more glorious the triumph.” Thomas Paine.